The Nobel Committee has refused to appease the Peoples Republic of China on two occasions awarding the Nobel Peace Prize to worthy recipients from Tibet and China. The Dalai Lama, the spiritual leader of Tibet, was awarded the Nobel Peace Prize in 1989 and in 2010 the Chinese dissident and prisoner of conscience Liu Xiaobo was awarded the Nobel Peace Prize. In both cases the dictatorship in Beijing threatened both the Nobel Committee and Norwegian government that there would be serious repercussions. Liu Xiaobo's wife was placed under house arrest and was unable to attend the ceremony. 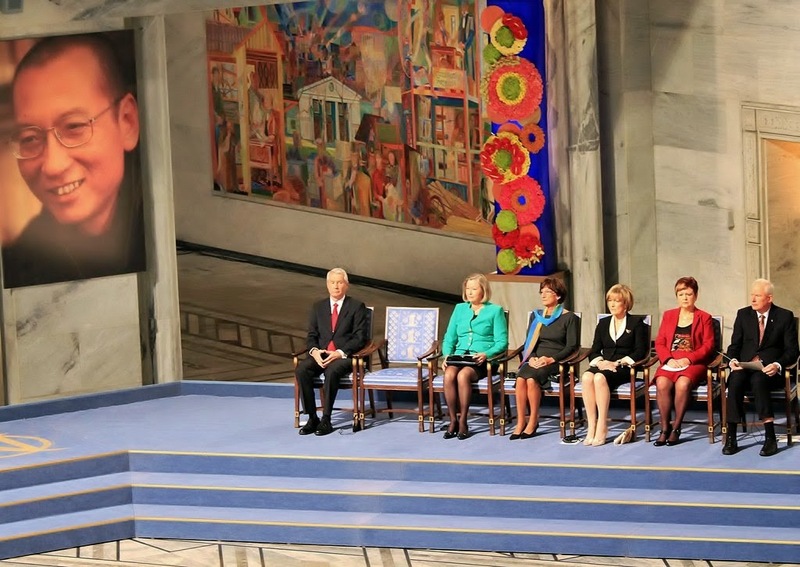 The Nobel Committee held the ceremony with an empty chair. Norway is a small country with a population of around 5 million. The Chinese communists have canceled meetings with representatives of the Norwegian government and frozen diplomatic relations since 2010. Four years later and top-level contacts between Beijing and the Norwegian government remain cut off, even though the government has no control over the decisions of the Nobel Committee. Both the Social Democratic government and its Conservative 2013 successor have tried to mend ties but what would require to appease the Chinese runs afoul of Norwegian principles and policies. Contrast the behavior Norway with that of the United Nations Human Rights Council and the United Nations High Commissioner for Human Rights Navi Pillay. "At a time when the Nobel Peace Prize is being awarded to Chinese dissident Liu Xiaobo, it is an outrage that the U.N. is hosting and co-sponsoring -- with China's Communist regime -- a massive propaganda display designed to cover up the government's systematic abuses of universal human rights." To add insult to injury on International Human Rights day when the Nobel Peace Prize ceremony was being held in Oslo and the pro-PRC regime propaganda farce was being held in Geneva the UN High Commissioner for Human Rights snubbed the event in Oslo refusing to attend while disingenuously claiming to not have been invited the day before. The fact of the matter is that the representative of the laureate approached Ms. Pillay and that the standard procedure of the Nobel Committee, according to Hillel Neuer is that "it won't invite any of the laureate's 50 invitees until they have confirmed with the laureate's representative that they have agreed to attend. So when Pillay and her spokesman Rupert Colville say she wasn't invited, they are being disingenuous and misrepresenting the truth." An international coalition of 38 nongovernmental organizations appealed to the U.N. rights chief to reverse her decision and attend the Nobel award ceremony for the imprisoned Chinese dissident Liu Xiaobo. In the end the UN High Commissioner for Human Rights skipped the award ceremony. 2014 marks the 25th anniversary of the Tiananmen Square uprising and massacre, and it is important to also remember that in 1989 many powerful nations preferred to maintain their "normalized" relations with the Peoples Republic of China at the expense of their solidarity with the victims of repression. Liu Xiaobo has no guns, bombs, or weapons and he does not recognize the Chinese regime as an enemy but nevertheless the Chinese communist leadership fears him. They have sentenced him to 11 years in prison because of his writings in favor of democratic reforms within the system and are now expending both economic and political capital in an effort to diminish this Chinese dissident’s international stature. He was imprisoned in December 2008 and tried and condemned on Christmas day in 2009. This December marks six years in prison for nonviolently exercising his fundamental human rights in defense of the rights of the Chinese citizenry. Fortunately, the snub by the High Commissioner for Human Rights and the propaganda show at the United Nations headquarters in Geneva do not diminish the greatness of this Chinese human rights defender, but unfortunately exposes the smallness and moral cowardice of the United Nations Human Rights Council. What price is one willing to pay for having normal relations with a totalitarian regime? Does it include making a sham out of human rights standards and abandoning victims of repression? Thank you Norway and thank you Vaclav Havel for showing the world that there are those not willing to pay the price. A group of 7 Norwegian Members of Parliament has nominated the Cuban Oswaldo Payá for this year’s Nobel Peace Prize. – The Nobel Prize to Cuba’s most important oppositional leader would be an important contribution to peace and democracy for a people who have been denied their fundamental human rights for far too long, the MPs write in their nomination letter. Through nearly two decades Oswaldo Payá has been the leading figure in a peaceful struggle for basic human rights in Cuba. Oswaldo Payá represents all Cubans who want a peaceful change based on reconciliation and dialogue. – We believe the Nobel Peace Prize would send a strong signal to the Cuban government that it is time for change, says Dagrun Eriksen, MP, deputy leader of the Christian Democratic Party and one of the signatories. Oswaldo Payá has built his work on the conviction that all human beings have inviolable rights. He believes that the right to freedom of speech is the basis on which to solve all other problems in society. Only when the people themselves can express their concerns, Cuba will be able to find its own way out of the country’s challenges. - Oswaldo Payá recognizes that freedom of speech and respect for fundamental human rights is a precondition for a peaceful development, says Jan Tore Sanner, MP, deputy leader of the Conservative Party and one of the other signatories. Oswaldo Payá has consistently tried to work within the frames of Cuban law, through petitions calling for the respect for basic human rights. When the Varela project succeeded in collecting enough signatures to set of a referendum in 2002, the Cuban regime’s response, however, was to arrest 75 oppositional leaders, in what became known as the Black Spring. Last spring, Mr Sanner and Mrs Eriksen took the initiative to form a support group for Cuban political prisoners in the Norwegian Parliament, including MPs from all the Norwegian parties. Following the release of more than 40 prisoners into forced exile last summer, 19 of them wrote a letter to the group, proposing that they nominate Oswaldo Payá for this year’s Nobel Peace Prize. - The support from the former prisoners of conscience shows how Oswaldo Payá has succeeded in gathering different groups of dissidents in dialogue and peaceful resistance, says Dagrun Eriksen. Jan Tore Sanner was one of the nominators behind last year’s winner Liu Xiabo. - Oswaldo Payá represents the same peaceful struggle for human rights as Liu Xiabo, says Mr Sanner. Payá has continued to call for unity and dialogue between all Cubans, in and outside the country. His National Dialogue program and All Cubans Forum, have involved thousands of Cubans in discussions on proposals for a peaceful change towards democracy. Payá is now again calling for a referendum on basic human rights. - Oswaldo Payá would be a worthy winner of this year’s Nobel Peace Prize, say Dagrun Eriksen and Jan Tore Sanner. Also know that Norway played an important role for the freeing of 75 Cuban prisoners of conscience. Simply put Maria your claim is incorrect.